Welcome to the family! Your year will be full of ups, downs, and all sorts of experiences. A comforting fact is that you are a part of the Cortina family and support system. The key to making your college experience great is to have an open-mind and be flexible. Don’t be afraid to be vulnerable. I’ve survived my freshman year and you will too! 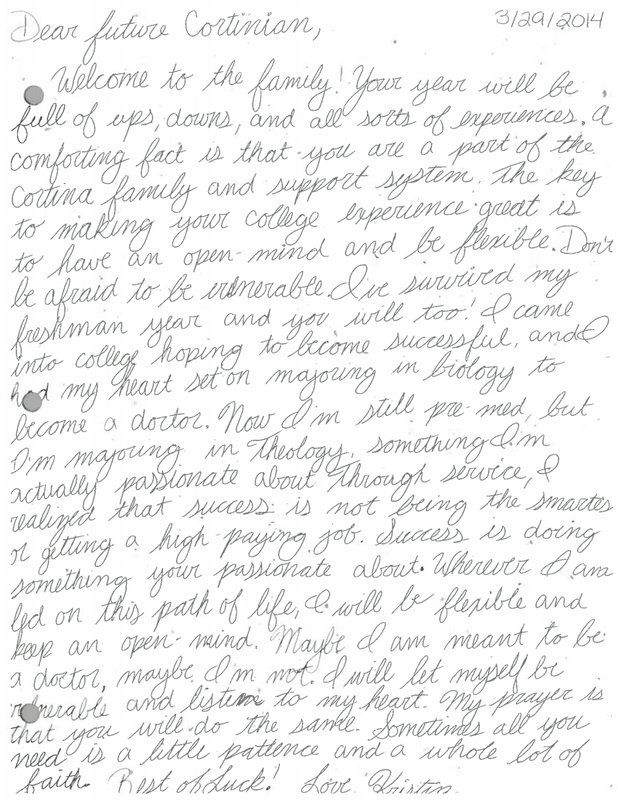 I came into college hoping to become successful, and I had my heart set on majoring in biology to become a doctor. Now I’m still pre-med, but I’m majoring in Theology, something I’m actually passionate about. Through service, I realized that success is not being the smartest or getting a high-paying job. Success is doing something you’re passionate about. Wherever I am led on this path of life, I will be flexible and keep an open-mind. Maybe I am meant to be a doctor, maybe I’m not. I will let myself be vulnerable and listen to my heart. My prayer is that you will do the same. Sometimes all you need is a little patience and a whole lot of faith. Best of luck!